Ravi Shankar (Bengali: রবি শংকর; born 7 April 1920), often referred to by the title Pandit, is an Indian musician and composer who plays the plucked string instrument sitar. He has been described as the best known contemporary Indian musician by Hans Neuhoff in Musik in Geschichte und Gegenwart. In 1956, he began to tour Europe and America playing Indian classical music and increased its popularity there in the 1960s through teaching, performance, and his association with violinist Yehudi Menuhin and George Harrison of The Beatles. 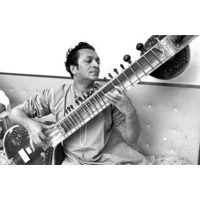 Shankar engaged Western music by writing concerti for sitar and orchestra and toured the world in the 1970s and 1980s. From 1986 to 1992 he served as a nominated member of the upper chamber of the Parliament of India. Shankar was awarded India's highest civilian honor, the Bharat Ratna, in 1999, and received three Grammy Awards. He continues to perform in the 2000s, often with his daughter Anoushka.